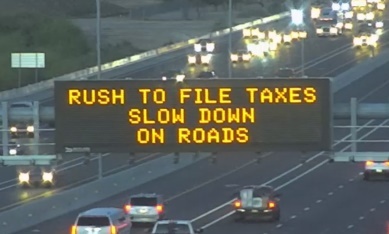 The tax-themed safety message will be featured on highway digital signs around the state, including in the metro Phoenix area, from 6 a.m. until 9 p.m. today (April 17). The Department of Revenue is encouraging taxpayers to e-file because it is easier and more secure. Visit the ADOR’s E-Services page to view the list of software providers certified to submit electronically filed returns with ADOR. The department also offers fillable forms that are online versions of tax forms designed for taxpayers who prefer to prepare their own returns.